There is no shortage of great milestones in Neopia each year; from the annual discoveries of various Neopian lands, to the birthday of Neopets itself each fall, there are plenty of days that hold special significance on the Neopian calendar. Today, however, we celebrate something completely unique, a phenomenon that will never again occur–the 650th issue of the Neopian Times! As Neopia's finest publication, the Neopian Times gives writers and artists from across the globe a chance to express themselves and allows thousands of Neopians to stay up to date on the latest current events. To commemorate the 650th issue of the Neopian Times, I've created four looks that will help your pet celebrate in style. This is all the fashion that's fit to print! Items Pictured: NC–Moltara Inventor Trousers, Caroler Shirt and Tie, Fetching Pirate Stubble, Debonair Mustache, Hot off the Presses Garland NP–Wind Up Pocket Watch (20 NP*), Neopian Times Writing Quill (1,000,000 NP), Neopian Times Background (1,000,000 NP), AAA Host Shoes (75,000 NP), Manor Room Crime Scene Foreground (200,000 NP). We begin with the head honcho, the big cheese, the main man himself! I'm talking, of course, about the Editor in Chief. It is the Editor in Chief's job to oversee every aspect of the Neopian Times, from designing article layouts to making sure the news gets out on time. A sharp dresser, the Editor in Chief should always look his best. Try Altador Cup Press Jacket or Premium Collectible: Knitted Shirt and Tie for male pets, and for a more feminine look use sometime cute and buttoned-up like Polka Dot Blouse. Miniature All-Purpose Writing Table will allow your Editor in Chief to scribble his notes down with ease, or if it's an especially crazy day in the office, try Written Word Shower to show the flurry of activity. Don't forget your handy Excessive Pocket Watch Collection Garland to keep up with pressing deadlines, or if you'd prefer something more portable, give your pet Father Time's Watch. Of course, Editor in Chief is also a highly stressful position; consider adding some Spilt Coffee (100 NP) or Bloodshot Eye Contacts (40,000 NP), as they'll speak to the late nights and frequent headaches your Editor in Chief will surely encounter. Items Pictured: NC–Altador Cup Stadium Wave Background, VIN Velvet Ropes, Detective Trench Coat, Super Sleuth Hat and Wig, Food Fight Shower, Electric Blue Tights and Boots, Marketing Maggie Wings, Altador Cup Trophy Garland, Bookish Shirt and Waistcoat NP–Stack of Tax Return Forms (12,000 NP). While the Editor in Chief is undoubtedly an important position, the Neopian Times would be nothing without the dedicated Field Reporters who record the news from every corner of Neopia. Field Reporters constantly brave perils such as battle zones, natural disasters, and rabid sports fans in order to get Neopia its news. 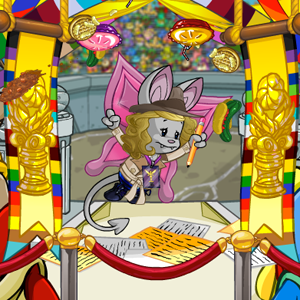 One of the best parts about creating a Field Reporter ensemble is that your pet can be reporting from anywhere in Neopia. The outfit I've created features a Field Reporter in the midst of a nail-biting Altador Cup match, complete with VIN Velvet Ropes and Food Fight Shower. There are a couple species that have reporter-themed wearables, but if your pet's species doesn't, don't fret! A classic fedora-and-coat combo is sure to give off the journalistic vibe your looking for, and you have plenty of options when it comes to those. Handy Gadget Hat has just about anything your Field Reporter will need on the job, or for a more polished look try Journalist Hat and Burgundy Velvet Jacket and Shirt. Altador Cup VIP Lanyard, Neopies Backstage Pass (800 NP), and several Usukicon badges are also wearable, so your pet can go behind the scenes for exclusive scoops. 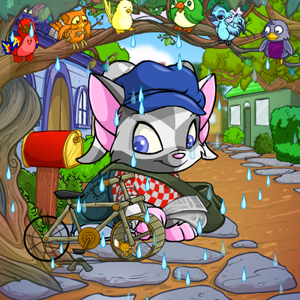 Items Pictured: NC–Rain Shower, A Rainbow Tree of Petpets, Blue Roll-Up Trousers, Lulus Adventure Satchel, Red and White Plaid Shirt NP–Wheelers Coconut Bike (65,000 NP), Blue Shoes (250 NP), Blue Newsboy Hat (8,700 NP), Neopia Central Neohome Background (2,000 NP), Elderly Male Acara Newspaper (paintbrush exclusive item). 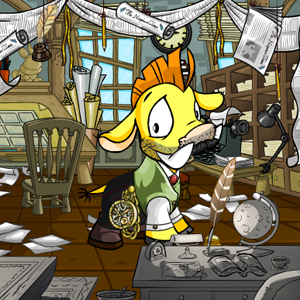 I would be remiss if I did not dedicate a customization to those hard working Neopians who are responsible for dropping the Neopian Times at our doors every week. Come rain or snow or sleet or shine, the dedicated Paper Delivery Pets of Neopia make sure the Neopian Times is distributed to each and every person. Newsboy caps are a staple for any Paper Delivery Pet outfit, and if blue isn't quite your color, you can choose either Brown Newsboy Hat (5,000 NP) or the more colorful Valentine Newsboy Hat. There is no handheld newspaper wearable for every species, unfortunately, so this look can be a bit tricky. You can easily get away with using Valentine Delivery Bag (even though it contains letters rather than newspapers), or forgo a handheld altogether and use a larger delivery bag like Loot Bag (3,900 NP) or Altador Courier Bag. Your Paper Delivery Pet must have a mode of transportation, and none is as tried and true as a bike; Pink Kadoatie Bicycle is great for female Paper Delivery Pets, or if it's winter time, try a festive Snowy Holiday Bicycle. Items Pictured: NC–Spring Finger Painting Background, Painters Supply Table, Blue Painted Feet, Patchwork Wig, Artwork Display Garland, Giant Crayon, Ocean Hues Makeup, Robertas Collectors Contacts, Crayon Wrapper Dress NP–Delicate Ink Frame (2,500 NP), Artist Smock (2,300 NP). For our last look, we're going back to the drawing board–literally! While the Neopian Times writers and reporters are wonderful, the Times also showcases some of Neopia's most talented artists each week. I recommend choosing a handheld to get started; Giant Crayon and Oversize Paint Brush are both whimsically large artist tools, but you can also grab something smaller like Dripping Paint Brush. Don't feel like your pet has to stick to one type of art, though; as any Neopian Times illustrator can tell you, it's important for an artist to work with a multitude of mediums. Mix and match crayons, paint, pencil, and everything in between! The best part about being an artist is getting to be creative and think outside the box. If you really want your pet to get into the artwork, why not make her a work of art herself? 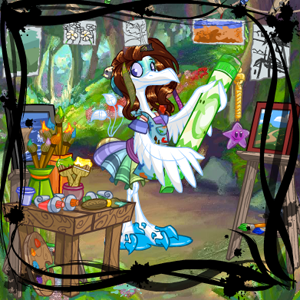 Painted on Canvas Background and Sketch Painted Background (1,200 NP) can both help you achieve this, or for something slightly subtler, use a pretty border like Framed Neopet Foreground to make your pet look like a framed picture. Hopefully these customizations have shown you all the versatility and potential that Times-inspired looks have to offer. From the Editor in Chief to the humblest Paper Delivery Pet, the Neopian Times is a community effort that represents the boundless creativity and diligence of Neopia's citizens. True, the 650th issue comes only once, but you always have issue 700 to look forward to! *Please note that all Neopoint prices are approximate and reflect Shop Wizard prices at the time of writing.